Rwandan president Paul Kagame speaks at a past function. File photo. Rwandan President Paul Kagame turns 60 today. 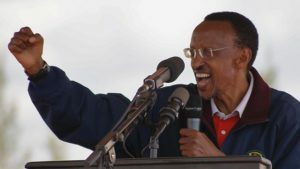 Considered among the new breed of African leaders by former US President Bill Clinton in the 1990s, Kagame who spent close to ten years in the trenches has helped lift his country from the abyss to a model African state although his democratic credentials are often questioned. PML Daily brings you the story of a leader loved and loathed in equal measure. 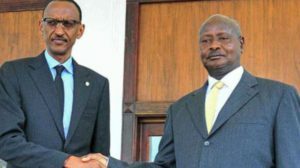 When President Yoweri Museveni launched a protracted war against Apollo Milton’s regime on February 6, 1981, two of the 27 fighters who were part of the NRA raid at Kabamba that began the war were Tutsi refugees: Fred Rwigyema and Paul Kagame. The two had grown up together in Kahunge refugee camp and were both active members of Rwandese Alliance for National Unity (RANU), a political refugee organization established by the Tutsi intelligentsia in Uganda following the overthrow of Idi Amin in 1979 with a major aim of uniting the Tutsi refugees in the country and discussing a possible return to Rwanda. Though primarily a forum for intellectual discussion, the organisation became radicalised after Milton Obote’s rigged election of 1980 resulted in many Tutsi refugees joining Yoweri Museveni to fight the Obote regime. Obote in turn denounced Museveni’s National Resistance Army (NRA) as composed of Banyarwanda. A failed attempt to force all Tutsi refugees into the refugee camps in February 1982 resulted in a massive purge, driving 40,000 refugees back into Rwanda. Juvenal Habyarimana’s government recognized only 4,000 of these as Rwandan nationals, while Uganda declared that they would take back only 1,000. The remaining 35,000 became destitutes and with hope as their last luxury, they joined the NRA rebellion enmasse. The contributions of Rwandans in the war were immediately recognized by the new government. Six months after taking power, Museveni declared that Banyarwanda who had resided in Uganda would be entitled to citizenship after 10 years and the 1995 Constitution recognized Banyarwanda as part of Uganda’s ethnic tribes. In December 1987, RANU held its seventh congress in Kampala and renamed itself the Rwanda Patriotic Front. The new RPF, dominated by Banyarwanda veterans of the war, was far more militaristic than the original RANU. On October 1, 1990, the RPF invaded Rwanda, starting the Rwandan Civil War. Despite commander Rwigema being killed on October 2, the RPF incursion was initially successful. However, the Rwandan Army received help from Belgium, France and Zaire and within a month had regained the initiative, forcing the RPF back into Uganda. Paul Kagame in his military fatigues. Paul Kagame was asked to return from his military studies in the United States to take over the RPF. Records indicate that Kagame found a force in disarray. The number had reduced from 4,000 to only 2,000 fighters. Many fighters had lost morale and several had deserted the nascent rebellion following the death of their charismatic commander, Rwigyema. Kagame’s leadership skills were put to real test. The 6.5 feet soldier began by changing fighting tactics, adopting the guerilla strategy as opposed to conventional war that had been preferred at the start of the war. Starting from Byumba and Ruhengeri areas, the rebel force gained control of much of the north of the country by 1992, forcing Habyarimana’s government to call for negotiations that led to the signing of the Arusha Accords in 1993, resulting in RPF personnel and other refugees being allowed to return to the country. The cease-fire ended on April 6, 1994 when President Juvénal Habyarimana’s plane was shot down near Kigali Airport, killing him and Cyprien Ntaryamira, the President of Burundi. It is still unknown who launched the attack; the RPF blamed Hutu extremists in the Rwandan government, while the government claimed that the RPF was responsible for the attack. The shooting down of the plane served as the catalyst for the Rwandan Genocide, which began within a few hours. Over the course of approximately 100 days, 1,000,000 Tutsi and moderate Hutu were killed, on the orders of the interim government. Kagame ended the genocide with a military victory on July 4, 1990. The RPF’s Pasteur Bizimungu was installed as President of Rwanda, with Kagame appointed Vice President. The RPF was split into a political division which retained the RPF name, and a military one, called the Rwandan Patriotic Army (now the Rwandan Defence Forces). In February 1998, Kagame was elected president of the RPF, and became President in March 2000. Paul Kagame was born 0n October 23, 1957 to a Tutsi family in southern Rwanda. His mother was younger sister to King Ndahindurwa’s wife. When he was two years old, the Rwandan Revolution ended centuries of Tutsi political dominance; his family fled to Uganda, where he spent the rest of his childhood. He began his primary education in a school near the refugee camp, where he and other Rwandan refugees learned English and began to integrate into Ugandan culture. At the age of nine, he moved to the respected Rwengoro Primary School graduating with the best grades in the district. He later attended Ntare School, one of the best schools in Uganda, a school also attended by President Museveni. The death of Kagame’s father in the early 1970s, and the departure of Rwigyema to an unknown location, led to a decline in his academic performance and an increased tendency to fight those who belittled the Rwandan population. He was eventually suspended from Ntare and completed his studies without distinction at Old Kampala Secondary School. After finishing school, Kagame made two visits to Rwanda, in 1977 and 1978. He was initially hosted by family members of his former classmates, but upon arrival in Kigali, he made contact with members of his own family. He kept a low profile on these visits, believing that his status as a well-connected Tutsi exile could lead to arrest; on his second visit he entered the country through Zaire rather than Uganda to avoid suspicion. Kagame used his time in Rwanda to explore the country, familiarise himself with the political and social situation, and make connections that would prove useful to him in his later activities. Rwandan president Paul Kagame (left) has been a close ally to President Museveni right from the NRA bush war days. File photo. Kagame, an incorruptible teetotaller who enjoys playing tennis and reading, trained under US Army Command and Staff College, Fort Leavenworth, Kansas (USA) and worked as an American-Ugandan intelligence agent under the RPF during the Ugandan Bush war and Rwandan civil war. Kagame and Rwigyema joined the NRA primarily to ease conditions for Rwandan refugees persecuted by Obote. They also had a long-term goal of returning with other Tutsi refugees to Rwanda; military experience would enable them to fight the Hutu-dominated Rwandan army. In the NRA, Kagame specialized in intelligence-gathering. The NRA, based in the Luwero Triangle, fought the Ugandan army for the next five years, even after Obote was deposed in a 1985 coup d’état and the start of peace talks. In addition to their army duties, Kagame and Rwigyema began building a covert network of Rwandan Tutsi refugees within the army’s ranks, intended as the nucleus for an attack on Rwanda. In 1989 Rwanda’s President Habyarimana and many Ugandans in the army began to criticise Museveni over his appointment of Rwandan refugees to senior positions, and he demoted Kagame and Rwigyema. They remained de facto senior officers, but the change caused them to accelerate their plans to invade Rwanda. They joined an organisation called the Rwandan Patriotic Front(RPF), a refugee association which had been operating under various names since 1979. Rwigyema became the RPF leader shortly after joining and, while still working for the Ugandan army, he and Kagame completed their invasion plans. According to Roméo Dallaire, the force commander of UNAMIR, Kagame succeeded because he was a “master of psychological warfare”. 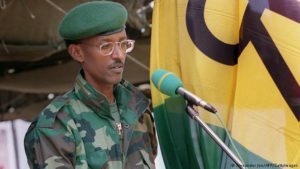 He exploited the fact that the government forces were concentrating on the genocide rather than the fight for Kigali, and capitalised on the government’s loss of morale as it lost territory. After assuming power, Kagame is believed to have participated in the two wars in the Congo. The 2001 United Nations Report of the Panel of Experts on the Illegal Exploitation of Natural Resources and Other Forms of Wealth of the Democratic Republic of the Congo alleged that Kagame, along with Ugandan President Museveni, were “on the verge of becoming the godfathers of the illegal exploitation of natural resources and the continuation of the conflict in the Democratic Republic of the Congo. In the late 1990s, Kagame began to disagree publicly with Bizimungu and the Hutu-led government in Rwanda. Kagame accused Bizimungu of corruption and poor management, while Bizimungu felt that he had no power over appointments to the cabinet and that the National Assembly was acting purely as a puppet for Kagame. Bizimungu resigned from the presidency in March 2000. Historians do not agree on the precise circumstances of Bizimungu’s departure; American author Stephen Kinzercontends that “one of the president’s friends called Kagame with the startling news that the president was preparing to resign” while Prunier states that Bizimungu was forced to resign, having denounced the National Assembly and attempted to sow discord within the RPF. Following Bizimungu’s resignation, the Supreme Court ruled that Kagame should become acting president until a permanent successor was chosen. The RPF selected two candidates, Kagame and RPF secretary general Charles Murigande; the ministers and parliament elected Kagame by eighty-one votes to three. Kagame was sworn in as president in April 2000. Several Hutu politicians, including the prime minister Pierre-Célestin Rwigema, left the government at around the same time as Bizimungu, leaving a cabinet dominated by those close to Kagame. Is he feared or loved? After RPF captured power, many soldiers carried out retribution killings; it is disputed whether Kagame organised these, or was powerless to stop them. Kagame later said he did not support these killings and failed to stop them. These soldiers, however, were later put on trial. It is reported that Hutu refugee camps formed in Zaire and other countries were attacked by RPF in 1996, leading to the killing of an estimated 200,000 people. Kagame and Museveni are also believed to have sponsored rebellions in Zaire, the first war (1996–97), that led to the installation of Laurent-Désiré Kabila as president in place of Mobutu Sese Seko and the second war launched in 1998 against Kabila, and later his son Joseph, following the DRC government’s expulsion of Rwandan and Ugandan military forces from the country. The war escalated into a continent-wide conflict which lasted until a 2003 peace deal and ceasefire. Although Kagame is popular in Rwanda and with some foreign observers; human rights groups accuse him of political repression. He won an election in 2003, under a new constitution adopted that year, and was elected for a second term in 2010. Kagame was elected again in 2017, and due to yet another change in the constitution, he could potentially be President until 2034. But the strict disciplinarian is also accused of stiffing dissenting views in his country of 11 million citizens. Many people who express dissenting views are either forced into exile, imprisoned or at worst killed under mysterious circumstances. 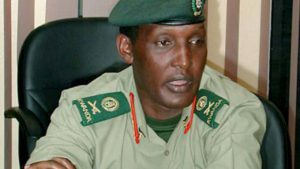 A case in point is Rwandan former spy Patrick Karegeya who was killed in a hotel room in South Africa where he had sought refugee while Gen. Kayumba Nyamwasa has survived at least three assassination attempts. Former RPF army commander Kayumba Nyamwasa has survived several assassination attempts. File photo. The infrastructure and economy of the country had suffered greatly during the genocide. Many buildings were uninhabitable, and the former regime had carried with them all currency and moveable assets when they fled the country. Human resources were also severely depleted, with over 40% of the population having been killed or fled. But as president, Kagame has prioritized national development, launching a programme to develop Rwanda as a middle income country by 2020 (Vision 2020). The country is developing strongly on key indicators, including health care and education, with an annual growth averaging 8% per year. Kagame strove to portray the government as inclusive and not Tutsi-dominated. He directed removal of ethnicity from citizens’ national identity cards, and the government began a policy of downplaying the distinctions between Hutu, Tutsi, and Twa. Kagame is also credited for having transformed Kigali into one of the most beautiful and clean cities on the African continent. Kagame is also credited for enabling the country heal after the trauma caused by the 1994 genocide. His government began prosecuting crimes committed during the genocide. The International Criminal Tribunal for Rwanda, operating under a United Nations mandate, was set up in Arusha to judge the most senior leaders responsible for the genocide. In addition, the Rwandan government determined to prosecute all suspected perpetrators, including the many ordinary citizens who had taken part in the killings, in order to end the “culture of impunity” that it blamed for the genocide. Between 1994 and 2000, 120,000 suspects were arrested. The prisons were overcrowded and the courts could not process all the cases. By 2006 only 10,000 of those arrested had been tried. The government introduced Gacaca, a village court system based on traditional Rwandan justice. The Gacaca process allowed for faster processing of cases, but lacked many safeguards and principles of international criminal law.